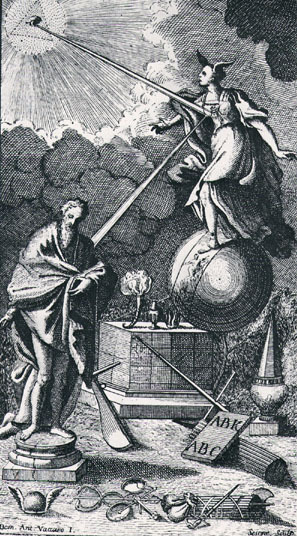 Vico inserted this frontispiece into the second edition of his New Science as a visual aid to the reader–but perhaps also to himself. He explicates the picture and in doing so offers his introduction to the content of the book, its purpose and structure and assumptions. Although I'll surely return to this image again, what I'm attempting to do now is simply gather and mark the basic components of and influences upon my work. The intellectual and material readymades I'm choosing to employ as I attempt to do something about this persistent itch to stop musing about material rhetoric and instead make something tangible of it. I intend to use these sources literally–that is, tangibly as well as conceptually. The objects I'm assembling will contain or feature artifacts that represent or even replicate the symbols, words, illustrations, and principles about which I've been reading and ruminating.